Board a boat for a ride through the outdoor waterways. Have a seat in a genuine motorboat. The bench seat is perfect for two adults and one or two small children. The steering wheel is in the middle, so everyone has access to it. Theyll let anyone use the boats steering wheel. Theres no scenery along the waterways—at least no scenes from animated movies or television shows. But theres attractive landscaping, including flowering trees, bushes, and beautifully arranged rocks. Also, youll have glimpses at other attractions. The Monorail passengers have a view of Motor Boat Cruise. Are you sure you really want to pilot your boat down that treacherous waterway? How will you avoid hitting those rocks, Monorail pylons, and other obstacles? Dont worry. Your boat is on a track and the steering wheel doesnt do anything. Someone forgot to close the hood. When you return to the dock, take a look at the boats that are out of commission. Okay, so its not the best ride in the park, but what else were you going to do with that “B” Ticket? 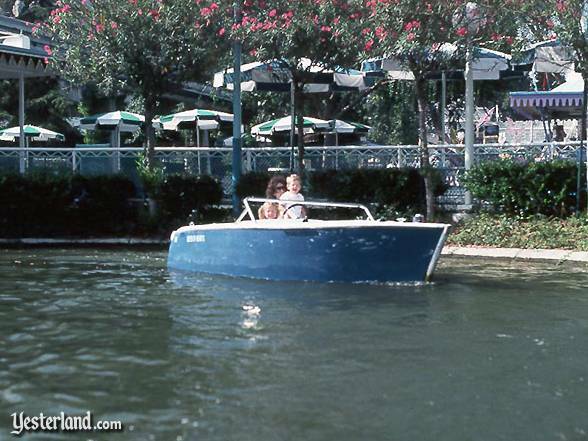 In Disneyland, the Motor Boat Cruise opened in 1957 on the border of Fantasyland and Tomorrowland. The waterways of the Motor Boat Cruise shared space with other attractions. 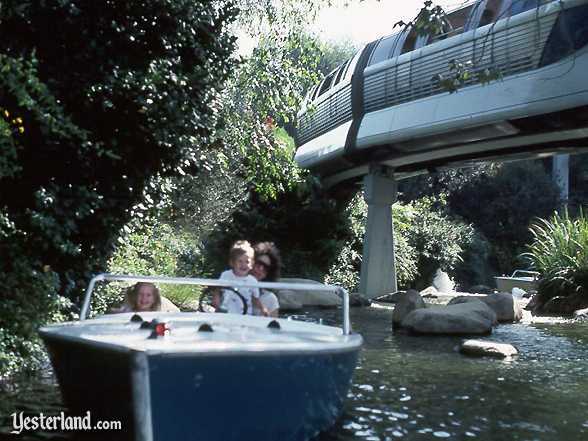 As the Viewliner train went speeding by, young motorists crossed the waterways on Junior Autopia bridges. 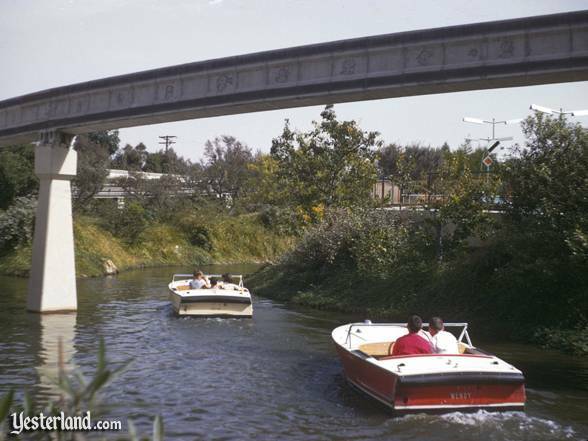 The Disneyland Alweg Monorail beams were added in 1959. 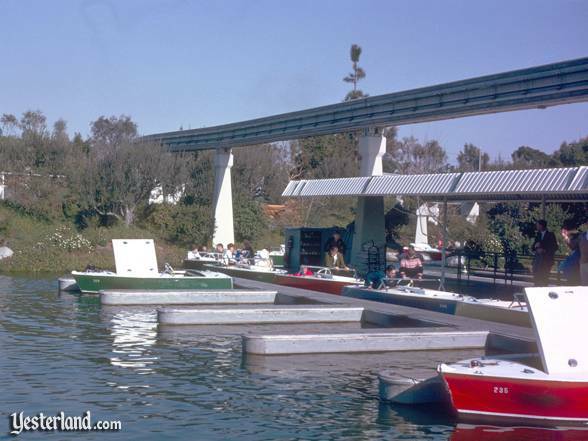 In 1959, almost everything changed in the corner of Disneyland where the Motor Boat Cruise, Junior Autopia, and Viewliner had been. The Viewliner and its little railroad track were gone. Instead, the elevated beam of the new Disneyland Alweg Monorail curved gracefully overhead. The new Fantasyland Autopia and an expanded Tomorrowland Autopia replaced the Junior Autopia. And the lagoon which had once been home to the Phantom Boats (which opened in 1955 and closed forever in 1956) was rebuilt as the crystal clear lagoon of the Submarine Voyage. 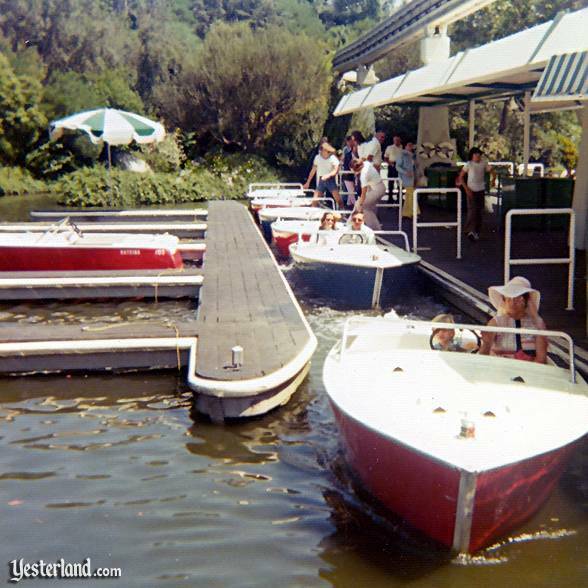 But instead of joining the Viewliner and the Junior Autopia as mere memories, the Motor Boat Cruise survived. The Motor Boat Cruise finally gained some scenery in 1991. 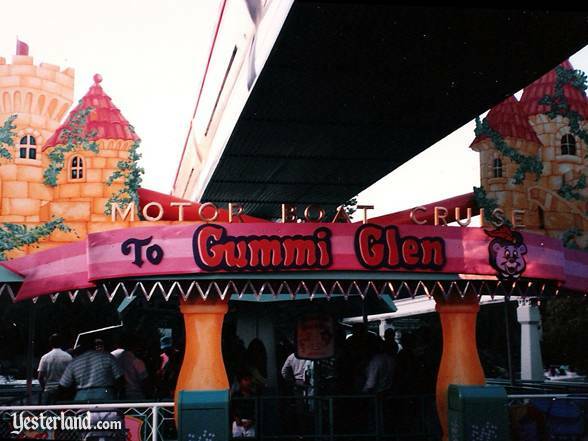 In 1991, as part of The Disney Afternoon LIVE!, the Motor Boat Cruise became the Motor Boat Cruise to Gummi Glen. Plywood characters from Disneys animated Gummi Bears television series made Gummi Berry juice along the waterway. 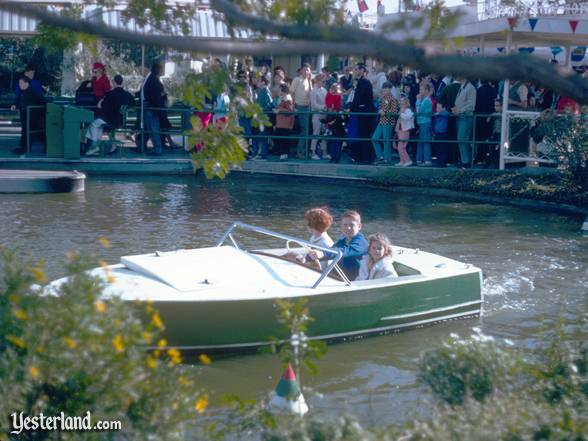 Although the Motor Boat Cruise survived the major 1959 project, it didnt survive the January 1993 opening of Mickeys Toontown a few hundred yards away. The word on the Internet was that to control overall park operating expenses, the operating budget for the Motor Boat Cruise was reallocated to Mickeys Toontown. So in January 1993, the Motor Boat Cruise closed permanently. Guests use the former loading platform as a seating area. (2004 photo). After the Motor Boat Cruise closed, Disneyland gave the loading platform and landscaped grounds a new name: Fantasia Gardens. 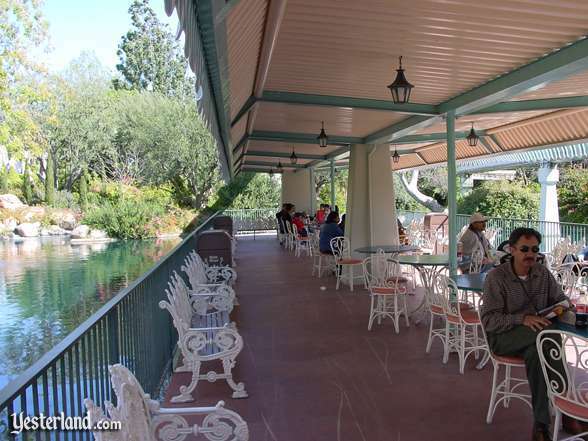 The canopy that once provided shade to guests waiting for the ride now provided shade to guests enjoying food from nearby counter-service and outdoor vending locations—or just taking a break from the crowds of Disneyland. In 2008, the loading platform became one of Disneyland Parks three designated smoking areas. Theres still water, but there are no boats (2004 photo). If the managers of Disneyland ever want to add more ride capacity, they might want to consider a new boat ride in the former channels of the Motor Boat Cruise. Photograph of the Motor Boat Cruise loading area: 1975 by Kathy McConnell, courtesy of Dave McConnell. Photograph of the Motor Boat Cruise under the Monorail: 1983 by Hal Schultz, courtesy of Jason Schultz. Photograph of the Motor Boat Cruise with umbrellas: 1983 by Hal Schultz, courtesy of Jason Schultz. Photograph of a green boat of the Motor Boat Cruise: circa 1959 by Frank T. Taylor, courtesy of Chris Taylor. Photograph of Motor Boat Cruise boats with hoods raised: circa 1959 by Frank T. Taylor, courtesy of Chris Taylor. Photograph of Motor Boat Cruise under Monorail beam: circa 1959 by Frank T. Taylor, courtesy of Chris Taylor. Photograph of the Motor Boat Cruise to Gummi Glen: 1991 by Chris Bales. Photograph of Fantasia Gardens seating: 2004 by Allen Huffman. 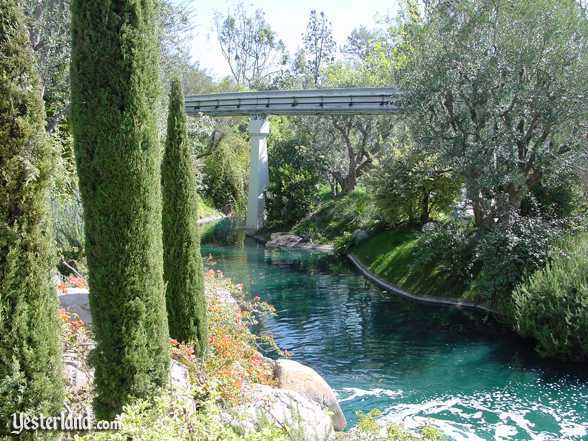 Photograph of a former Motor Boat Cruise waterway, now Fantasia Gardens: 2004 by Allen Huffman.